We had a very nice Ethan Allen cherry wood queen bed frame for years; it had been Ash’s parents’. Then we upgraded to a king and it sat disassembled in Dakota’s room. I tried to sell it for way less than its worth on local garage sale sites but no one would bite. Finally, a friend of ours traded it for a loft bed for Elliot. So Saturday, after a run and a trip to the flea market and Sonny’s, we took her the frame and we brought back the loft bed. 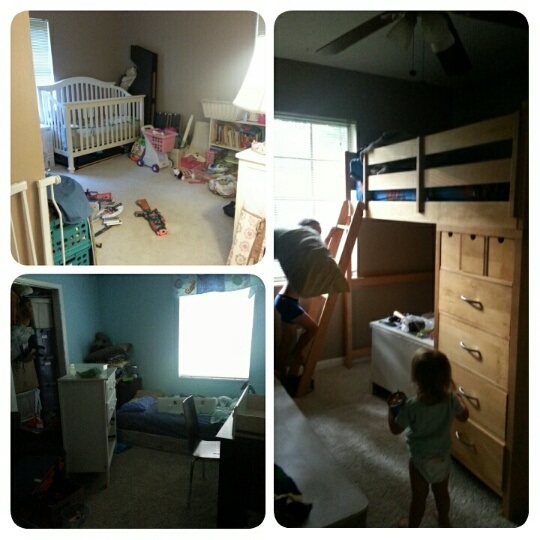 That spurred an entire relocation of items in each of the kid’s rooms. Dakota’s crib got moved after the big pieces of wood vacated her room, Isaac traded one of his bookshelves for Elliot’s dresser – since the loft bed has a ton of extra storage – and then there was all the set up and vacuuming and organizing books and board games and all the junk we’ve acquired. I even posted to Facebook that we own too much stuff and I felt like throwing it all away and moving to the woods with nothing! I didn’t realize all the moving around that would follow the acquisition of this new piece of furniture. That activity pretty much dominated our weekend. I mowed and did laundry yesterday and by 9 PM I was exhausted. I struggled through grading papers and folding clothes even though I had a headache. This morning, I have already had a work phone, graded a few papers, and cleaned up my office. Happy Monday! I know you’re tired of me always posting Culture Club songs so since it’s a freebie, let’s go in an entirely other direction. I don’t normally listen to pop music but here are a couple songs my 8 year old loves and keeps playing over and over! Totally love the tune “Shut Up, and dance with me”, it totally ROCKS! Great job! Have a rockin’ week! Hope you’re enjoying the give-aways! Girl you are one busy mama! I think a loft would be nice to own if I have more children. That Old Flame might be Bad For You, but you’re on Top Of The World having a House Party!